"I think the hardware capabilities of the Wii U Game Pad are a good match for Tengami"
Last week, we revealed that UK studio Nyamyam was impressed with the Wii U eShop and the potential it offers for independent developers. Keen for more knowledge, we got in touch with Nyamyam's Jennifer Schneidereit to talk about Wii U, Nintendo and Tengami - the studio's atmospheric iOS adventure title. Nintendo Life: Can you give us some background info on your studio? Jennifer Schneidereit: Phil Tossell and I founded Nyamyam in late 2010. We met while working at Rare on Kinect Sports and decided at the end of the project to set up our own independent studio to create beautifully crafted games, games that we want to play. We are currently working on our first game called Tengami, which is due to be released in summer 2013 on iOS. Phil was with Rare for over 13 years. He started as a programmer on Diddy Kong Racing and then went on to be the Lead Programmer on Starfox Adventures and Kameo. David Wise, another Rare veteran, is composing the music for Tengami. Dave usually needs no introduction, as he is well known for his work on the Diddy Kong Racing and Donkey Kong Country series. We are very happy to be working with him again. "Dave usually needs no introduction, as he is well known for his work on the Diddy Kong Racing and Donkey Kong Country series"
Ryo Agarie is Nyamyam’s resident artist. At Rare he was an artist on Perfect Dark Zero, as well as the Art Director of the XBOX Live avatars. Before joining Rare I was at a Japanese game developer in Tokyo called Acquire. I worked on games like Shinobido: Tales of the Ninja and Way of the Samurai 3 as a programmer. What's the inspiration behind Tengami? In Tengami, you control a character through a pop-up storybook. At any moment in time the world can fold flat. We came up with this while watching a video on YouTube. The video was simply someone turning the pages in a pop-up book. Whenever the page was turned, what was on screen folded away and at the same time unfolded a new world. Watching this video brought back a lot of childhood memories of playing with pop-up books; the sense of wonder and anticipation we felt when the page turned. The more we thought about it, the more we wanted to explore pop-ups as a game mechanic. The art style in Tengami is minimalistic, yet strikingly beautiful and is inspired by a deep affection for traditional Japanese arts and crafts. In Japan they have a concept called 'wabi-sabi', that really doesn't translate well into English, it's a concept you feel more than describe. But roughly speaking it means a kind of imperfect, almost rustic simplicity. You often see this expressed in traditional Japanese crafts such as paper-making and pottery. This idea was a big inspiration for the art and design of Tengami. Can you explain the objective and core gameplay of Tengami? Tengami is an atmospheric adventure game that you play at your own pace. You explore the beautiful pop-up world with your character and come across obstacles and puzzles. These puzzles or obstacles are usually solved by folding and unfolding either the whole world or parts of it. 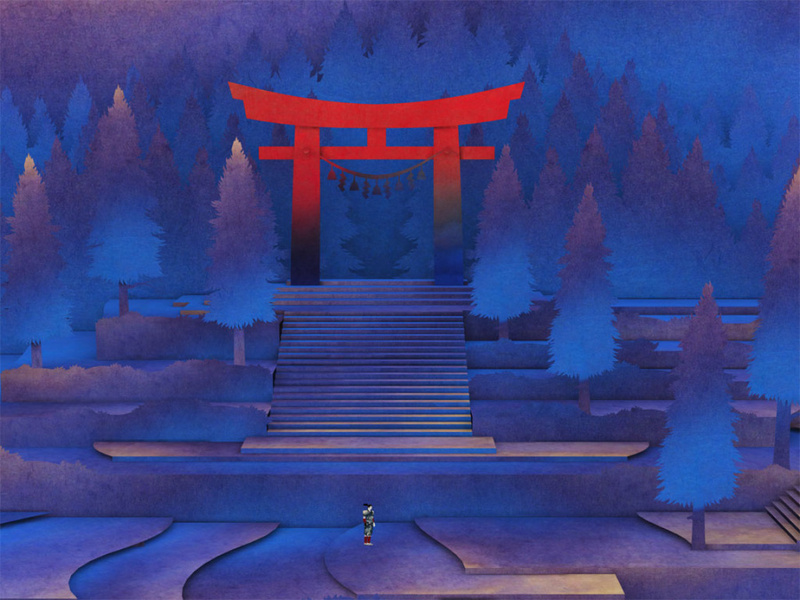 Tengami is a very quiet and almost meditative game that does not prod you with objectives. There is an objective or meaning to everything you do in Tengami, but we want the players to figure out themselves what is going on in the world of Tengami. "There is an objective or meaning to everything you do in Tengami, but we want the players to figure out themselves what is going on in the world of Tengami"
In the iOS version the pop-ups simply follow the player's finger, so you have full control over how fast or slowly you want to manipulate a pop-up. The interaction feels very magical, but ultimately you have to try it for yourself to fully grasp it. The concept is so new that not even gameplay videos do it full justice. What do you feel makes the game unique? Tengami is the first game to take place inside a completely authentic paper crafted 3D pop-up world. There is no other game with this kind of gameplay. It took us more than a year to develop the technology that powers Tengami. At first we learned how to build pop-ups with paper and then we figured out the mathematics behind it. This then allowed us to create the game’s engine and tool kit. 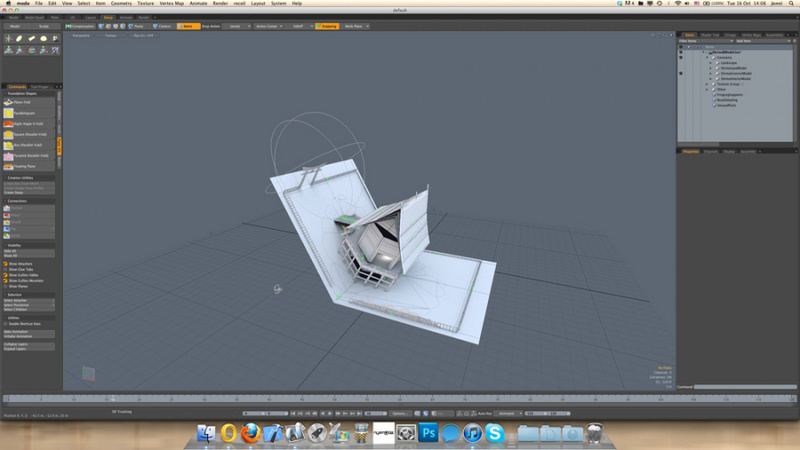 Everything that you see in Tengami can be built in real life with paper, scissors, glue and can actually fold. 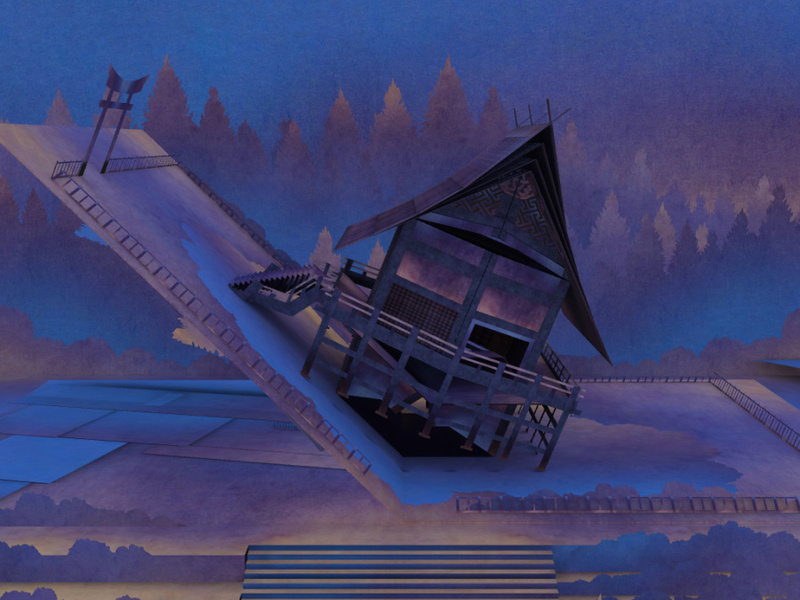 Of course you would have to know how pop-up works in order to reverse engineer the world of Tengami. Another unique point is the art style. I have never seen a game that looks like Tengami. It has a very Japanese aesthetic, yet has a universal appeal. What conversations have you been having with Nintendo regarding Wii U development? We have been showing Tengami at a few game shows and festivals over the past few months. At one of them someone from Nintendo must have seen and liked it, so they decided to casually contact us last week. I had a lovely phone conversation with Nintendo Europe regarding their plans for the Wii U eShop and how small independent developers - like Nyamyam - can be a part of it. It was very much just an initial conversation; a start to explore possible mutual interests. For obvious reasons I can’t give any details, but I was very impressed and excited by what I heard. What's your impression of Nintendo's attitude towards indie devs? In the past the company has been somewhat dismissive, and at one point even insisted that "garage" devs weren't part of its plans. In my opinion the fact that they are initiating discussions with independent developers shows that they value independently created games. My impression is that Nintendo hope to have a large and varied portfolio of quality games, by mainstream and independent developers. "A lot of people I studied with expressed interest in making games for the iOS App Store, because they see it as an easy way to make money"
I was actually in the keynote at GDC when Iwata-san coined the term and I didn't understand it as him being against independent developers. A lot of independent developers are highly educated, experienced in game development and many - like us - have a mainstream background. But more than anything these developers are truly passionate about making games and pushing the boundaries of what games currently are. I thought that Iwata-san referred to opportunists that have no honest interest in making games. For example, a lot of people I studied Computer Science with expressed interest in making games for the iOS App Store, because they see it as an easy way to make money. They have no experience with making games and are by no means passionate about learning how to make games or even play them. There is no respect for the craft of making games. When I sat in the keynote, that's what I thought when I heard the term ‘garage’ dev, and not that Nintendo does not want my game, simply because I choose to create games independently - which really just means that I do it on my own money and nothing more. The Wii U Game Pad is a close match to the iPad. What thought have you given to bringing Tengami to Nintendo's system? The thought crossed my mind briefly when the Wii U was officially announced. I think the hardware capabilities of the Wii U GamePad are a good match for Tengami. I can see the game working really well on it and I would like to bring Tengami to the Wii U, but we will have to discuss this in greater length internally - as well as with Nintendo - before making any decisions and announcements. "I really hope developers will explore this and that we will see many asynchronous multiplayer games that leverage all of the input possibilities"
What's your opinion of the Wii U, based on what you've seen so far? The fact that the Wii U does so many things at once - motion controls, GamePad controls, touch and stylus controls - made it at first a little confusing in my mind. But at the same time it excites me to see how this combination can be used for new game concepts. I really hope developers will explore this and that we will see many asynchronous multiplayer games that leverage all of the input possibilities. Following Tengami, what's next for you guys? We are completely focused on Tengami at the moment and really have no plans for the time after. A nice relaxing beach vacation would be great! The style of this game is just amazing. I'm definitely watching it closely. I'm sure this will be a good game, and seeing it on the Wii U eShop would be a nice addition for gamers. I would be interested to see this come to the Wii U. This sounds like a very relaxing, atmospheric game. I like that. I will certainly keep an eye on this. This game looks interesting and I do hope that Nintendo will encourage Indie developers, would make me very happy. This is exactly the kind of thing Nintendo should be trying to entice onto the Wii U platform. Good to hear Nintendo's actively reaching out to indie developers, I'd love to see the Wii U eshop become a haven for indie games. I personally much prefer playing on a big-screen TV, so I'd buy this for Wii U as opposed to my idevices. The lovely quiet pacing reminds me of LostWinds, I'm curious if there's going to be enemies and battle mechanics in this (whilst not every game needs it, it can be done well even in a game like this, and the paper artstyle would certainly make for interesting boss battles). this is a game the wii-u need's, it's so amazing! I really hope this comes to Wii U.
I hope he's right about the way Iwata used the term "garbage dev", I find it rather odd that Nintendo of all companies being known for creativity and innovation would view indie devs in that way. Indie devs would make for a good fit for Wii U. Not only do they come up with some really fun, creative games but they're also a nice option for those who might not be able to afford retail games as often as they'd like (not calling anyone poor, but $60 a pop is a lot) and a great way to revive popular series or genres (Double Dragon Neon comes to mind). Tengami? More like Tengimme, amiright? David Wise is enough to get my attention. Nintendo didn't call indie developers "garbage developers". It called them "garage developers". That logo is very Tenchu like. And I now see why - the artist is from Aquire! Coincidence much? Also the fact that there is a genuine Japanese artist on board allays some of the fears I had about this game - it definitely adds some much needed authenticity. I hope it makes it to Wii U, if not I'm sure my iPhone will suffice just fine. Oh my god, I can't believe I actually read "garage" as "garbage". Now I know I'm not that near-sighted, but maybe thats a sign I should start wearing my glasses when I read these. Talk about having egg on your face, thanks for pointing that out @True_Hero. Looks interesting! Hopefully we also see it on Wii u! This one looks very interesting indeed. I think we are going to see it on the Wii U and that would be great. "It was thought it would be impossible to convert it to the Game Boy"
"It was literally a game changer"
"It all just felt like a Nintendo game"